Comics Experience Blog: GUEST BLOG: CE Alum Alex Wilson on "The Time of Reflection" and Comics Experience! GUEST BLOG: CE Alum Alex Wilson on "The Time of Reflection" and Comics Experience! 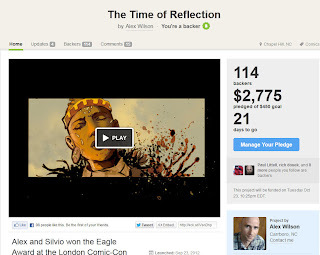 CE alum and Creators Workshop member Alex Wilson has launched a Kickstarter campaign for his and artist Silvio dB's comic project "The Time of Reflection", which ends in about a week. 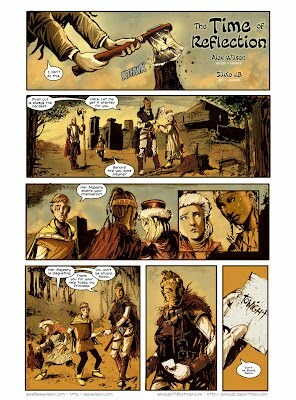 Below is a Guest Blog by Alex, discussing the project and Comics Experience. 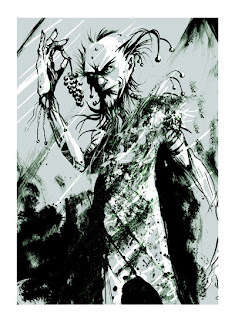 I was a trial member of the online forum and workshop here at Comics Experience when someone shared the info about "The Huntsman's Challenge," this special Eagle Award competition co-sponsored by the Universal Pictures film Snow White and the Huntsman, requiring an original five page, full color dark fantasy comic. With a deadline only about a month away, I was inspired and impressed with a number of veteran workshop members both for committing so quickly to the challenge and for their amazing encouragement of each other. Inspired and impressed, yes. I wasn't surprised, though. Members of this forum have treated me as part of the group literally from day one... when I joined and immediately jumped into a monthly writing challenge with a deadline that evening. Critiquing five scripts and writing my own piece for the challenge left me without enough brainpower left to do a proper introduction post. I'm fairly certain I wouldn't have heard about the competition in time to do anything about it if it wasn't for my friends here at Comics Experience. I also might not have been inspired enough to join in the fun without their examples. If I hadn't met CE Staff member Paul Allor here, I might not have purchased his Clockwork anthology and seen his collaboration with Silvio dB, which led me to check out Silvio's other work (including a story he created with fellow CE member Amy Chu) and his website to see what his coloring style might be like. And of course the script wouldn't have been in the shape it was in without the feedback and encouragement of so many active forum members. And when the judges selected "The Time of Reflection" as one of the two finalists (Paul and Amy's stories were among those shortlisted, by the way! ), with the winner to be selected during an open voting period, Comics Experience members and staff (thanks Rob, Andy, everyone!) were among my most vocal get-out-the-vote champions. I wouldn't be surprised if a healthy percentage of retweets and Facebook Likes and other social awareness that led to votes and support for our comic could be ultimately traced back to this community right here. Finally: when we won the Eagle Award, I found out about it from a CE friend before I heard anything official. A few weeks ago, we launched a Kickstarter to fund a printed version of "The Time of Reflection." The enthusiasm and encouragement here continues to be amazing and overwhelming, as members of the CE community were among the first to back the project. But when I think about Comics Experience and why I became a full member after my trial expired, I don't consider it as a collection of these generosities or the many quantifiable ways I've benefited from being a part of this community these last eight months. I think of the amazing people who I look forward to seeing at the next comics event or convention, whether I'm going as a guest or as a fan. And I realize that, for less than the cost of a flight + hotel + attendance fees for the average weekend convention trip, I get a full year of having that communal experience anytime I want, where I can discuss comics with new friends who are as serious about funnybooks as I am. Thanks, Comics Experience. Looking forward to the next eight months! 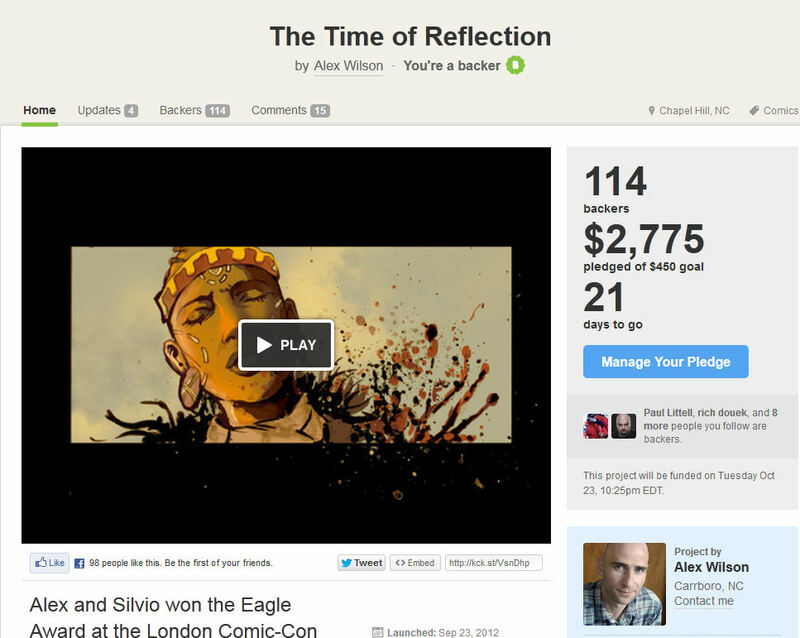 Check out more information (and support the project) on "The Time of Reflection" on Kickstarter!